Ships Tuesday, April 30 if ordered in the next 17 hours and 18 minutes! 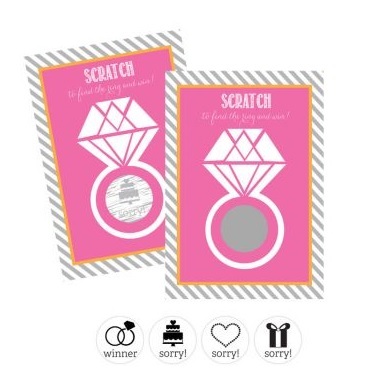 Invite guests to play this fun and unique bridal shower game! Our Scratch Off Game Cards are printed with a diamond ring and the phrase "SCRATCH to find the ring and win!". Cards have a circle with hidden wedding related icons that say "sorry! ", only one winning card will reveal the rings and that's the "winner!". Guests must SCRATCH off the silver coating to reveal their hidden surprise. 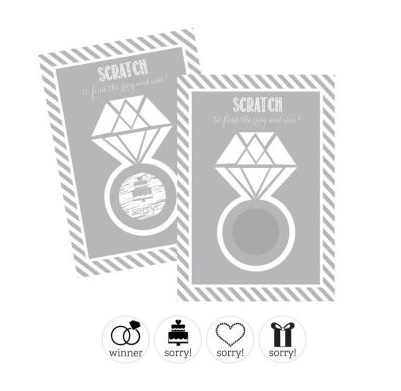 Each set of scratch off game cards contains 11 losing cards and 1 winning card. Cards arrive with winning card on top of the deck. Size: 2.75" x 4"